Smoothies are the easiest breakfast around and a fast way to fill you up with the healthiest foods. They are a chilly treat — but that doesn’t mean they are just for the warm weather months, you can enjoy them well into winter using seasonal and frozen foods to make them more fun and festive. 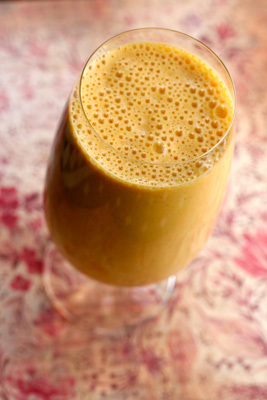 Blending the same old smoothie recipe can not only get boring, but it can bore your taste buds and leave you wanting. 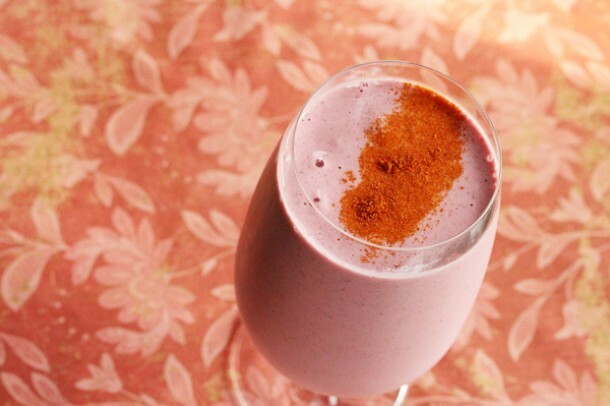 Using spices that you normally wouldn’t pair with fruit or smoothies is a great way to make them unique and add more flavor. Spices also happen to be incredibly healthy and don’t add excess unhealthy fat, sugars, or salt. I’m featuring spices that often don’t get a lot of play in most people’s cooking: cardamom, cayenne, and turmeric. Black or green cardamom can stimulate digestion, decrease bloating, and most importantly decrease inflammation. It’s a main ingredient to chai tea and has a wonderful musky perfume and minty flavor. Ground green cardamom is most widely available… it looks much like finely ground black pepper and can be purchased in the spice isle of your local grocery store. Cayenne, like all spicy chilies, has amazing health properties, even in its dried powdered form. Experts say that the active ingredient in chilies, capsaicin, alone or with other antioxidants, may reduce blood cholesterol, triglyceride levels, and platelet aggregation that can cause formation of blood clots. Capsaicin is also being studied for its ability to clear congestion from the lungs, improve immunity and boost weight loss. Turmeric is considered a panacea of healing in both traditional Western medicine and in holistic circles. There is a large body of studies out there about its ability to soothe skin disorders like psoriasis, calm the nervous system and PMS, and even stop cancer cell growth. It’s all due to turmeric’s active ingredient called curcumin, which works as a powerful anti-inflammatory. Stock your fridge, freezer, and pantry with seasonal fruits and vegetables like pomegranate, citrus, pumpkin, butternut squash, apples, pears, kale, and beets before you test out these fun flavors. Chop and prep your fruits and veg ahead of time and freeze them in snack baggies to make your morning schedule run more smoothly. Each smoothie serves 1 and can be transferred to a travel mug to take on the road. Place all ingredients in a blender and process until smooth. Add 1/4 cup cold water to adjust the texture if needed and serve immediately. When it comes to making the perfectly silky smoothie, it’s all in the quality of a blender. If you have a blender already, great! But you want to take your smoothie to the next level, try a blender with a powerful motor. I’m a big fan of the Blendtec and use mine on a regular basis. Looking for more smoothie ideas? 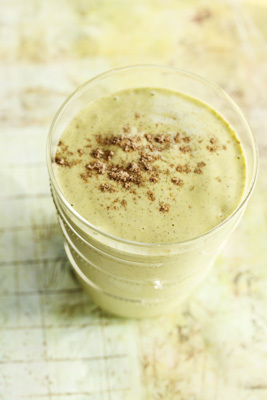 Check out my other smoothie collection on Superfood Alchemy! These are great recipes. I’ve been looking for alternatives to starting every smoothie with spinach.